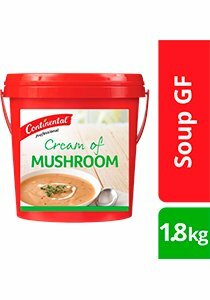 The CONTINENTAL Professional Cream of Mushroom GF soup mix is made with real mushroom. It creates a hearty, creamy and homestyle taste. Every product in the Soup range has been specifically designed for the needs of food service professionals. Place the hot water in a large pot and whisk in the CONTINENTAL Soup Mix. Bring to the boil while stirring continuously, then simmer for 10 minutes. Prevent cross-contamination with gluten during preparation to ensure gluten-free meal. Servings per package - 158. Serving size - 170 ml. ** Contains naturally occurring glutamates. ^ From sustainably grown mushroom.